It is an extolled fact that Hyderabad wears its Nawabi style with much élan and elegance. Well, over the years some of this attitude has brushed on to its cultural scenario too. So when artistes present themselves in the city, rest assured the Midas touch is a done thing! 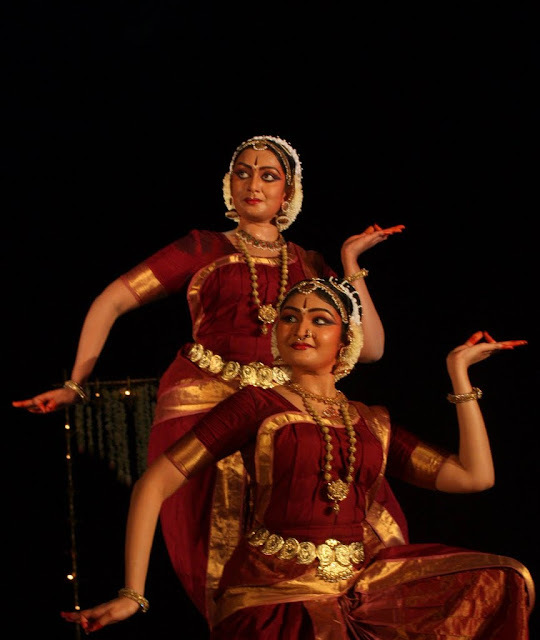 Katyayani Thota and Shravya Varakantham presented ‘Lasyaka’ a grandeur Kuchipudi duet production that sparkled with extravagance to bring together students, artistes, connoisseurs and art lovers of the twin cities to pack Ravindra Bharathi to the core. Lasyaka did complete justice to its christened name for there was ‘Lasya’ emanating from everything that was exhibited – the duo, the dance, the music, the costume, the intricate hair do, the compering, the back drop, the props, the lighting, the organization and the marketing. 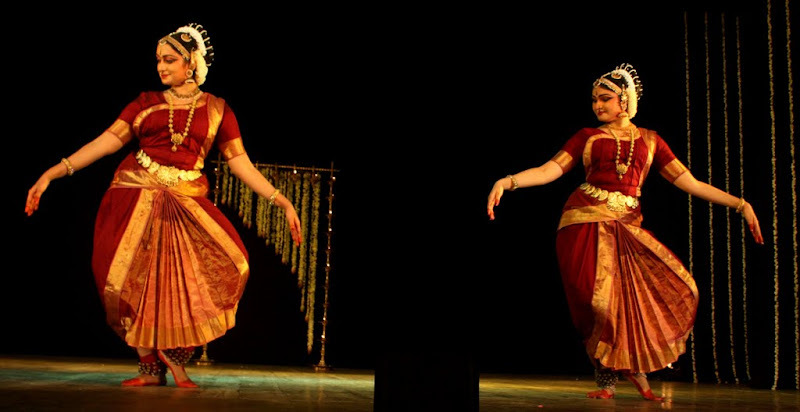 Katyayani has a Masters in dance from the University of Hyderabad and is currently pursuing her doctorate and Shravya is an IT professional having undergone traditional Kuchipudi tutelage. Says Katyayani “The idea was conceptualized because Shravya and I longed to perform together. Though we have spent considerable years in training, this is our first attempt at something. I am glad that our teachers and elders in the field encouraged this initiative”. The production, she said took a whole half a year to take its final shape. Where the dancers had the passion towards exhibiting a challenge, their guru, mentor, nattuvannar and vocalist Shri DSV Sastry was the perfect fuel for the passion. The recital had five different pieces woven together commencing with a Ganesha Vandana ‘Hamsadhwani Bhushitha Herambham’ penned by Katyayani and the dancers embodying the elephant headed lord through slow and heavy movements interluded with soulful humming of 'Ta num Tha, Tha Tha …'. Shravya, with her lively stage presence brought the holy Ganges to the gathering in ‘Tunga Tarangini Gange’. The item was laced with fluid movements and picturesque poses even as the music ensemble did a fantastic job in accompanying the artiste unravel the story of the Ganges flowing from the matted locks of Lord Shiva. Intelligent use of stage, lights and props assured in the next item ‘Bala Sarasa Murali’ where the gigantic flute suspended at the corner of the stage gave a rare aesthetic feel. The item was a good mix of nritta and nritya. DSV Sastry proved yet again his mastery over the craft of choreography in a brilliant picturisation of the popular ‘Dashavataram’. While a ‘Sarpa Nade’ showcasing the entire life of Rama made up the Rama Avatar, the Krishna and Kalki Avatar delineated from the de-rigour practices. Whoever said the youth of today were flickering away from the classical arts, these two dancers put it all to rest as they had their young audience glued and knowledged enough to applaud at the right junctures. Icing on the cake was the ending of the Thillana which for me was a lasting feast for the eyes –5-6 brisk poses for a swift ‘Jathi’ rendered with absolute silence and full spotlight! Kudos to team Lasyaka! Kalaparva wishes the production many more such successful shows in future!